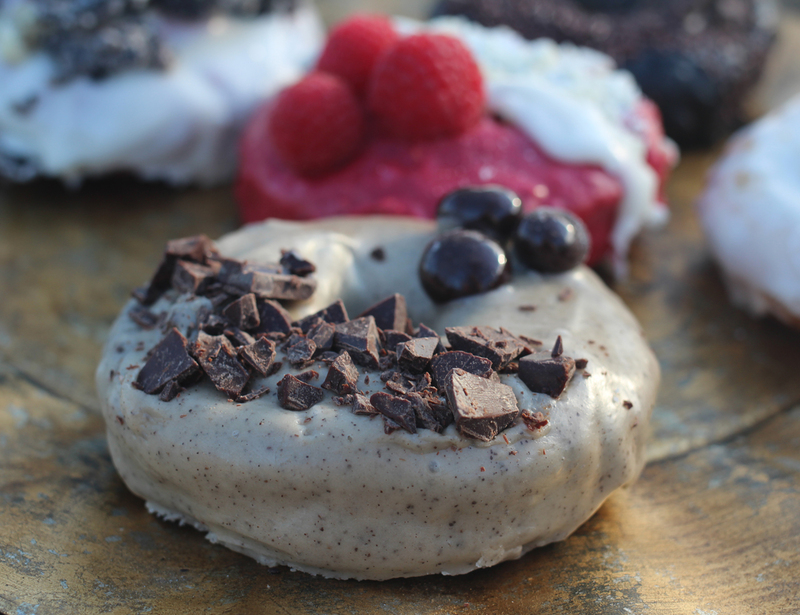 Fashion + Fried’s Java Chip doughnut features an espresso glaze, chopped bittersweet chocolate, and chocolate-covered espresso beans. Walk into Roswell’s Land of a Thousand Hills coffee shop on a Friday morning and you’re likely to catch a glimpse of some particularly eye-catching doughnuts from Fashioned + Fried. Officially launched last December, Juliana and Clayton Frederick’s creations have been luring people to the OTP coffee shop and other pop-ups around town, thanks in part to some viral Instagram marketing. She and husband Clayton, a recruiter, have been together since their freshman year at the University of Alabama, so he’s been her guinea pig and sounding board from the start. She’d occasionally pitch business ideas sprung from her culinary hobbies, none of which stuck until she suggested selling doughnuts. They both happened to love old-fashioned doughnuts (they even had them served at their wedding at JCT Kitchen), and it dawned on Clayton: “Why haven’t you been pitching that all along?” Juliana then spent the better part of a year perfecting her doughnut technique. Connected by a mutual friend, Clayton inquired with Hanna Brown, the general manager at Land of a Thousand Hills, about selling Fashion + Fried’s doughnuts in the coffee shop. Brown was interested upon one condition: they had to produce a vegan doughnut to get the job. Clayton immediately agreed to the next-day taste test, despite having zero experience with vegan baking. “It’s funny, because we put bacon on everything,” Juliana laughs. “Our first vegan doughnut was horrible.” The pair spent the rest of the day and night tinkering with vegan recipes until they found one that mirrored the old-fashioned doughnuts they love. It blew Brown away and earned them space in the pastry case. The original vegan flavors, vanilla bean and raspberry toasted coconut, are still among the brand’s many rotating flavors. 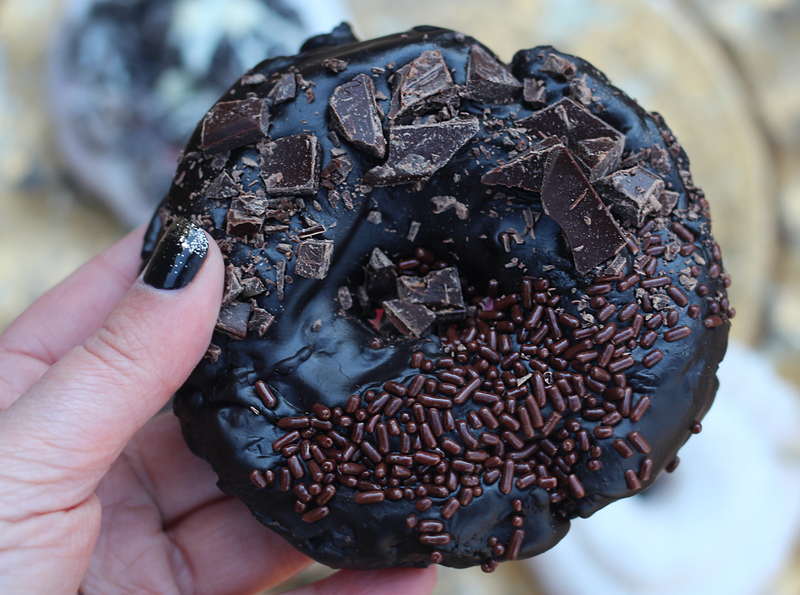 The Death by Chocolate doughnut features dark chocolate glaze, chocolate chunks, and chocolate sprinkles. A playful spin on the campfire classic, the s’mores doughnut includes a homemade marshmallow and graham cracker brittle. 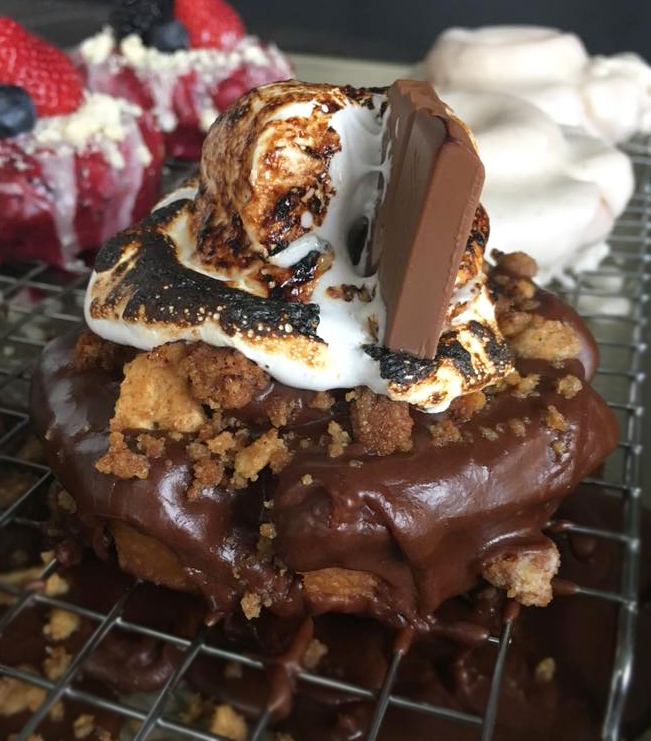 Armed with a pair of culinary tweezers, Juliana carefully arranges graham cracker brittle, homemade toasted marshmallow, and a piece of Lindt chocolate to create the s’mores doughnut, one of the best-selling flavors. In contrast, the vanilla bean doughnuts are less ornate, glazed with a simple flecked vanilla and confectioners sugar mixture, but customers still flock to the flavor. Knowing when to show restraint can be challenging for her. “I’m not the type of person to keep things simple; I want everything as decadent as possible,” she says. “Clayton keeps me in check because I tend to over-complicate things.” They rotate their flavors every two weeks and often include customers in which varieties to feature via Instagram story polls. Juliana hopes to one day open her own doughnut shop and is encouraged by the fact that Fashioned + Fried’s doughnuts tend to sell out each week. For now, you can find them at Land of a Thousand Hills on Fridays, Saturdays, and Sundays, and at various pop-up events around town at stores like West Elm and J. Crew. Follow the brand on Instagram to stay in the loop. Doughnuts start at $3 and usually sell out within a few hours, so plan to arrive early.